Taking out a commercial loan for your business can be both an exciting and stressful venture. Colorado commercial loans give business owners opportunities they wouldn’t otherwise have to make their dream of starting their own business come true, to expand and take their business to the next level, to cover unexpected expenses, keep their business running during hard times when cash flow is poor, and much more. While there are many advantages to taking out a commercial loan for your business, it doesn’t go without risks. 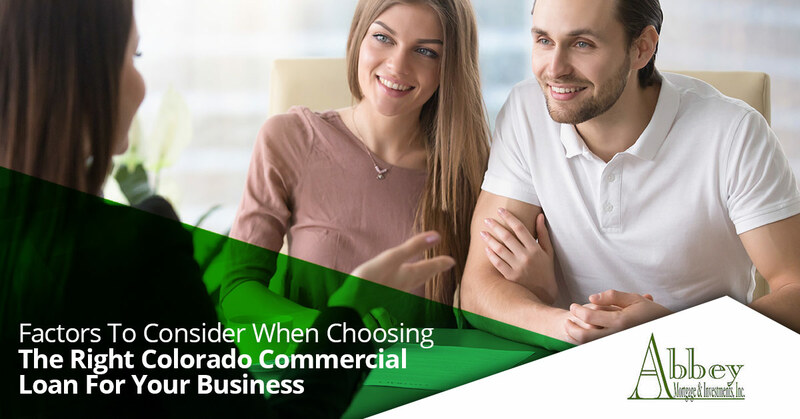 That being said, choosing the right Colorado commercial loan for your business is critical. To ensure you make the best financial decision for your business, here are a few things to consider when choosing a commercial loan. To help you make the best decision in terms of the type of commercial loan you need and type of lender you should borrow from, you should first think about what exactly you need the loan for. In case you missed it, here are the most common reasons business owners take out Colorado commercial loans. When it comes to business financing, you want to ensure you borrow enough money to achieve your business goals, however, you don’t want to borrow too much money where you cannot pay back your loan. Instead of borrowing the maximum amount that you can, consider how much funding your goals requires and only borrow the amount that you need to make it possible. Knowing how much you need to fund your deal will also help you make the best decision in terms of what type of commercial loan you need and what type of lender to borrow from. How quickly do you need the funds? What is the length of the loan term? Is there a big balloon payment? At Abbey Mortgage & Investments, we take pride in being the go-to source for commercial loans in Colorado. With our direct, in-house loan fund and flexible loan options, we can get you the funds to reach your business goals fast and for the best rates. If you need a Colorado commercial loan in Colorado Springs, Denver, Boulder, Loveland, or Fort Collins, contact us today to discuss your financing needs. We look forward to helping you achieve your goals.